The Vietnamese ao dai has seen significant evolution throughout the years and has been in the forefront of the fashion industry, as well as the subject of political reform and cultural identity since its mainstream inception during the Nguyen Dynasty. Today, it remains a trademark symbol of Vietnamese tradition and although it hasn’t been officially deemed as the national dress, it has acquired widespread popularity in Vietnam and abroad. Honestly, no one is 100% sure when the Vietnamese ao dai first sprouted its roots, but there is enough historical context for us to draw our own conclusions. Some claim that the dress first appeared as early as AD 38-42 and was introduced by the Trung sisters, two heroines who led a revolution against the Chinese Han Dynasty which marked Vietnam’s initial independent state. The majority, however, agree that the Vietnamese ao dai has its origins in China, and experts claim that it wasn’t until 1744 that it began to make a lasting impression on society. At this time, King Nguyen Phuc Khoat had been crowned to rule over the southern regions of Vietnam. The north was being ruled by the Trinh Lords of Hanoi who wore garments called ‘ao giao linh’, reminiscent of the Chinese robe worn by the Han people. In order to distinguish between northern and southern members of his court, King Nguyen Phuc Khoat demanded that all southern courtiers wear trousers covered by a long silk gown. This dress is said to have been an amalgamation of Han Chinese and southern Champa style attire. 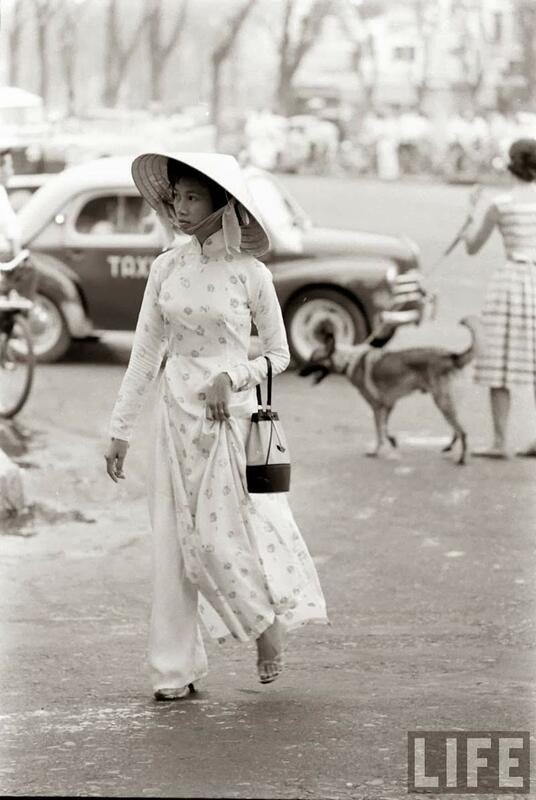 Perhaps this was our first glimpse of what we now call the Vietnamese ao dai. 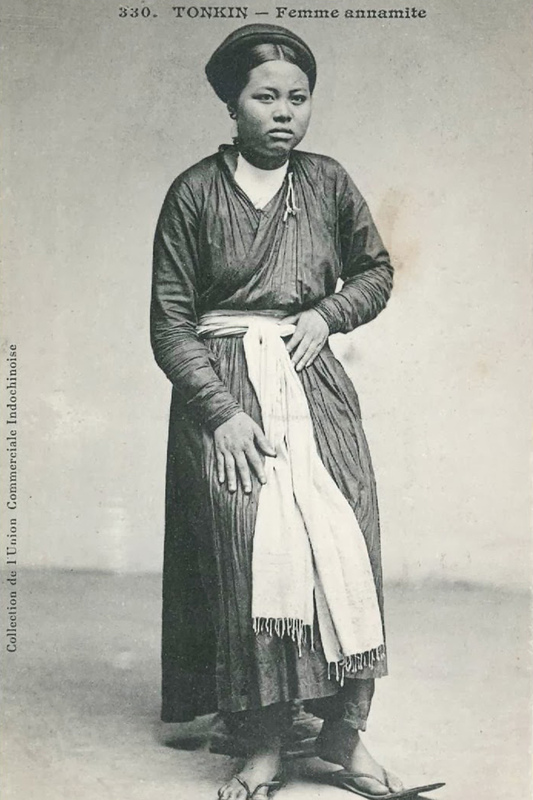 The 19th century saw the first major evolutionary phase, and the garment primarily worn during this period was referred to as the ao ngu than. But how is it different than the ao dai of today? The garb most widely worn during the 1800s was perhaps the five-panel gown. This design consisted of two panels in the back, two in the front and a hidden “baby flap” underneath the front panels. This was also the first dress to feature slits on each hip, which is still one of the standout features of the modern Vietnamese ao dai. Unlike later designs, the ao ngu than had a much looser fit and was also much shorter in length than we see now. Once the 1930’s had rolled around the French had colonized and as a result, western influence had begun to penetrate fashion trends. The biggest innovation in the history of the ao dai came about as the result of a Hanoian woman named Cat Tuong, or as she was then called Le Mur. Her redesign brought about numerous innovations in the gown, many of which fit the mold of our concepts of the present version. She tightened up the ao dai, and made it fit the form of the Vietnamese woman’s body, raised the shoulders, lengthened the dress so it reached the floor and introduced a bright color scheme. In other words, she made it sensual, flattering and appealing to the eye. After only four years of popularity, the ao dai le mur was temporarily put to rest as painter Le Pho removed all western influence from its design, and replaced it with several renditions of the four-panel gown. From this point on until the 1950s, his style of Vietnamese ao dai remained popular as it stood well with traditional ideology. Around the late 1950s, the United States replaced France as the occupying force, and it was at this point the ao dai began to enter the world of politics yet again. In 1958, Tran Le Xuan, the wife of the president’s chief advisor and brother made a fashion statement by wearing the dress with gloves, a v-neck collar, and short sleeves. Although some praised her for her elegant take on the costume, many others were offended and felt this action was done in poor taste. This was right around the time when the Vietnamese ao dai fell out with the northern regions of the country. In fact, the distaste for the modern version was so strong that the government banned the dress as it appeared to serve as an acceptance of capitalist ideals. Around the same time, the gown still held ground in the south, and Saigonese designers Tran Kim and Dung revolutionized the dress again with the addition of raglan sleeves. This is a distinguishing feature with a diagonal seam which runs under the arm to the collarbone area. Many women found this favorable as it provided further mobility and a more comfortable fit. As a whole, the dress fell out of style across the nation until the late 1970s and early ’80s when the Vietnamese ao dai came back with an even tighter fit, a higher collar and flared pants. This rendition was visibly similar to what we see still being worn circa 2017. The modern ao dai is a thing of grace, beauty, and cultural pride. Although many traditions begin to disappear over time, the costume remains as strong as ever. Today, the national dress can take numerous creative forms and women of any age or generation can wear the gown with flowing confidence and elegance. Most recent innovations include emboldened cuts and an array of materials, patterns, and colors. As a whole, the Vietnamese ao dai is a dress that each woman can customize to fit her own taste and figure. From high fashion to traditionalist and everything in between, there are good reasons why this dress is such a dominantly treasured element of Vietnamese culture. Traditionally, the color of the fabric was very important as it was an indicator of one’s social status. Younger women were often adorned in white which symbolizes purity and youthfulness. Once a girl begins to mature she can move forward to pastels, granted she remains unmarried. After married, she has the freedom to wear much stronger hues. There are also particular shades reserved for ceremonies such as blue and purple. Take note that the above information clings to customary ideas, and today women are not confined to these cultural restrictions. As the Vietnamese ao dai continues to undergo physical transformations, societies’ beliefs about how it should be worn have become much more malleable as well. Originally, the gown was made of silk to allow for a light and comfortable fit, as well as a fast drying process. Perhaps you’ve never seen any brave man strutting to work in an ao dai, but they are for men too. Although these days males prefer to reserve the dress for very important occasions like weddings, it can still be seen, particularly with older generations.